Apple released the new iOS 11 a couple of days ago. If you are an iPhone, iPad or iPod user then you are going to be waiting for this update. Most of the changes aim to make the Apple devices more intelligent and productive. Most of the new features are more prevalent with iPads since they want to make use of their screen size, Apple Pencil integration with iPad Pro and even the Dock. The iPhones are not left behind, as they will receive substantial updates as well. 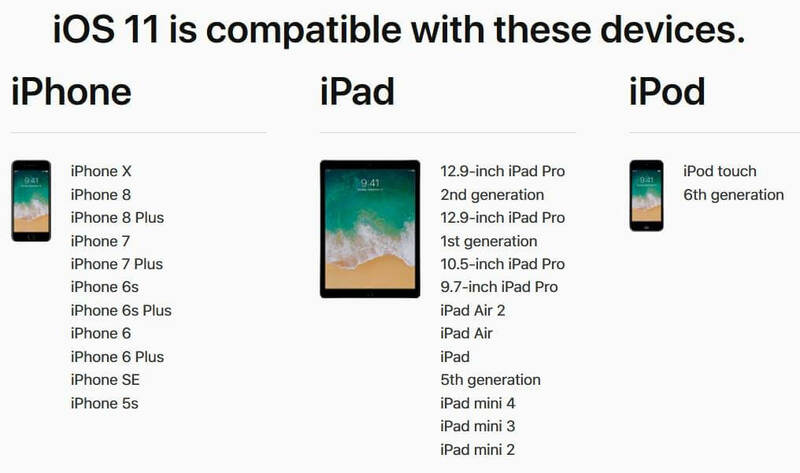 The image above shows the complete list of Apple devices that are compatible with iOS 11. A more detailed explanation of all the new features can be found on Apple's website if you want more details. Make sure to back up your files before you update your device. In addition to that, make sure that your device has enough storage and battery for the update. Make sure that your connection is stable as well.